Olaus Rudbeck (also known as Olof Rudbeck the Elder) was a frighteningly brilliant philosopher, scientist, anatomist, inventor, and professor of medicine at Uppsala University. As an enthusiastic teenage student, he was one of the first to discover the form and function of the lymphatic system. His findings were published in the paper Nova exercitatio anatomica in 1653. (The established Danish anatomy professor, Thomas Bartholin, published similar findings in the same year, however, and claimed priority.) Rudbeck built Sweden’s first anatomical theatre, in the face of public outrage, which you can still see today in its distinctive cupola on top of the main university building. When not dissecting corpses, Rudbeck pursued the noble art of botany, and established Uppsala’s Botanic Garden, now named after his successor, Carl Linnaeus. Rudbeck’s main obsession, though, was Atlantis. He shared Plato’s belief that this lost civilisation was real. More than that, he advanced the theory that the fabled city was actually situated somewhere in the north of Sweden. He was assiduous in his search for archaeological evidence, so bustled tirelessly about his native land studying rune inscriptions, excavating natural landmarks, and collecting folklore and tales from the Norse sagas. In the course of these expeditions, he invented stratigraphy, a method for dating artefacts by soil strata, which is still in use today. 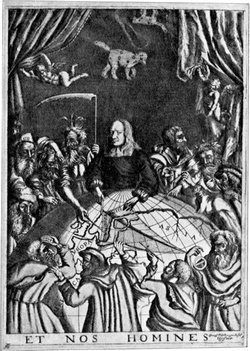 The resulting book, Atlantica, outlined in detail Rudbeck’s patriotic theory that Sweden was indeed the cradle of civilization, settled after the flood by the descendants of Noah. Many contemporaries considered the professor bats. Atlantica was published in parallel columns of Swedish and Latin, and thus could be read by scholars deficient in the Scandinavian languages. (Every decent scholar had Latin in those days.) In four volumes, and running to over 2,000 pages in length, it was a work of undoubted scholarship as well as excited imagination. Having set the world to rights, Rudbeck found time to work with his son (fortuitously named Rudbeck the Younger) on the hugely ambitious and poetically titled Campus Elysii — the Elsyian Fields — a botanica that aimed to survey and illustrate, in their natural colours, every plant so far discovered in the world. Sadly, thousands of woodcuts and many copies of Atlantica were lost in the fire that destroyed most of Uppsala on the 16th of May, 1702. While his house was burning down and his manuscripts were being reduced to ashes, Rudbeck stood on the roof of one of the university buildings and shouted fire-fighting instructions at the people of the city below. Rudbeck died shortly after the fire, some say from despair and disappointment caused by the loss of his great work. Or possibly because documentary proof that Sweden was indeed the first and lost cradle of mankind perished in the conflagration. This entry was posted in Burned manuscripts and tagged Atlantica, Atlantis, Rudbeck, Sweden on 14 November, 2012 by Horatia.